The Greek god Hephaestus (also known as Hephaistos) was the god of fire, metallurgy, and blacksmiths. 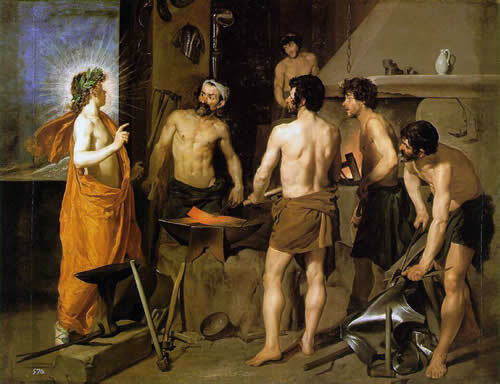 Because of his great skills at metal crafting he was also the blacksmith of the gods, creating some of Greek mythology's greatest weapons and armor, including Hermes' helmet and Achille's shield. He wasn't just a weapon-maker, though. The Greek god of fire also represented craftsmen and artisans of all kinds, though he was primarily known for his metal crafting using his hammer and anvil in the hot fires of his forge. For a Greek god Hephaestus has a somewhat sad story. Different versions of his story vary slightly through Greek mythology, but the effect remains the same. In one version, the great goddess Hera gave birth to Hephaestus without the help of her husband Zeus as revenge for his immaculate conception of Athena, who was born fully grown and armed from Zeus's head. The other version has Hephaestus splitting open Zeus's head with an axe to release the fully-grown Athena. Either way, the two main gods were not too happy with the Greek god of fire from the beginning. Hephaestus was the only Greek god or goddess who was disabled. He was born with a bad leg that he had trouble walking on, and was said to have been uglier than any of the other gods. In the eyes of his mother he was imperfect, so she threw him into the sea. Luckily a group of sea nymphs rescued him, but he was never welcome on Mount Olympus along with the other gods. Being a Greek god Hephaestus wasn't going to just sit back and take the abuse, so using his incredible metallurgy skill, he crafted a beautiful golden throne for his mother to sit on. What nobody else knew though, was that the throne was cursed and that once Hera sat upon the throne, she could never get up. After the other gods tried in vain to free her, they eventually got so desperate that they begged Hephaestus to return to Mount Olympus, giving him a permanent place there if he released his mother. Hephaestus refused until his friend Dionysus, the god of wine, got him drunk enough to agree. Once there, the fire god refused to release Hera unless she promised to make Aphrodite, the love goddess, his wife. Having no choice, Hera agreed, and thus the ugliest god of all was married to the most beautiful goddess. Nemesis, the goddess of vengeance, must have been proud. The plan didn't work exceptionally well in the long run, as Aphrodite eventually fell in love with Ares, the god of war - whom she eventually married instead. Return from The Greek God Hephaestus to the List of Greek Gods and Goddesses.